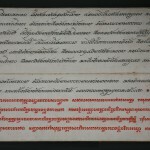 This is a very rare, authentic and uniquely important Samud Thai Book, dated back to the Ayutthaya period. 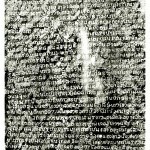 It is written in the Ayutthaya script called ” Aksorn Thai Yaw”, and believed to be the in hand – writing of Choa Fa Kung, the famous Ayutthaya Prince Poet. 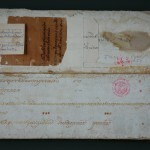 The document, studied and deciphered by Miss Kongkaew Weeraprajak, expert in old documents and ancient script of the National Library, was found to be in complete and original form. It was presented to Prince Damrong Rajanuparb by a high ranking official in the reign of King Rama VI. 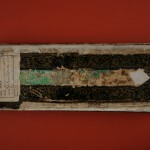 It was then handed over to the National Library of Thailand for safeguarding and has since been preserved there. Its content is the story of Pra Mokala, one of the chief disciples of The Lord Buddha, preaching and subduing the Nanto Naga, King of the Naga World, who later embraced Buddhism. 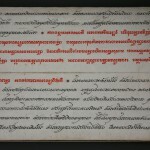 This is a rare version of Jataka, considered to be additional and outside of the traditional Buddha’s Life Jataka, found in many old books of Ayutthaya and Bangkok Periods. 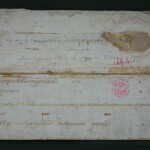 This is a uniquely important documentary heritage, dated to the year 1913 of Buddhist Era. It was discovered at the temple of Wat Pra Yeun, in Lampoon Province, and has been safeguarded in a special chamber of the Temple. 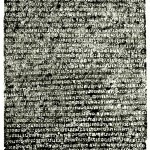 Studied by Dr. Prasert Na Nagara, it was found to be inscribed in the Ram Kamhaeng Script, and is the first important evidence that the Ram Kamhaeng Script had an early influence on the Lanna ‘s Phakkam Script. 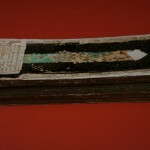 Its content tells the story of Pra Samana, a Buddhist monk from Sukhothai who was invited by the King of the Lanna Kingdom to teach Buddhism of the Lanka Sect to the monks and laymen in the Northern Kingdom. The story inscribed significantly includes the Miracle of the Buddha’s Relic witnessed by Pra Samana at Wat Pra Yeun, and witnessed by all people present on the scene, when the Chappunna Rungsi or the rays of 7 colors beamed out of the Relic Chamber of the Stupa. Copyright © 2019 คณะกรรมการแห่งชาติว่าด้วยแผนงานความทรงจำแห่งโลกของคณะกรรมการแห่งชาติว่าด้วยการศึกษา วิทยาศาสตร์ และวัฒนธรรมแห่งสหประชาชาติ (ยูเนสโก) All Rights Reserved.